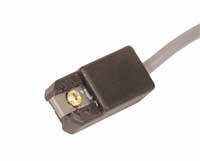 Provides a splice-free installation of a tach, shift light or rpm device. âš Clip to a coil packï¿½s voltage wire to produce a common 12-volt signal. âš Connect to a diesel injector wire to provide an easy tach installation. âš Operates with 5-24 volt input for universal applications. Just think of things you can easily accomplish with our new GMR Pickup! This little device simply attaches, no splicing or cutting, to a current carrying wire and turns that information into a 12-volt rpm signal. This signal can be used to activate a shift light, rpm activation switch or a tachometer. One example is to connect the GMR, which stands for Giant Magnetoresistive, to a diesel injector current wire. This will produce a signal that can be used to trigger a tachometer or a shift light! Thereï¿½s no easier way to connect an rpm device to a diesel engine! Another example is on a late model engine equipped with a coil-on-plug ignition system. One of the coilï¿½s primary current wires is simply routed into the pickup clip and GMR converts this pulsing into a 12-volt signal for a shift light!